Maybe it’s the league-wide change in strikeout rate that makes low-K pitchers seem so worthless, or maybe we just don’t know what to do with a young pitcher who’s both not a true prospect but not organizational depth either. We mock them, call them names (“He’s like a another Nick Blackburn. Ewwww.”), we tell them to stay in Minnesota where they can be with their own kind, and then we get back to wishcasting that some fireballer like Felipe Paulino or Dan Cortes can put it all together. I think that’s the context for M’s fans reaction to the news that Blake Beavan had been named the M’s 5th starter yesterday ahead of Hisashi Iwakuma. Here’s the thing, though: it’s not a terrible plan. Hisashi Iwakuma’s 2005 season was marred by a shoulder injury – an injury that limited him to around 129 innings in 2006 and 2007 combined. He returned better than ever, winning an Eiji Sawamura award (Japan’s Cy Young award) in 2008, and posting 200 innings in 2010. But shoulder issues returned in 2011, and he pitched only 119 innings. He was pretty successful in those innings, though offense appeared to be down league-wide last year, but either due to the injury or a long layoff after he was shut down, his stuff’s still not back to his 2008-2009 peak. At the World Baseball Cup in 2009, Iwakuma’s fastball averaged about 91 MPH and he showed a plus splitter at around 86 mph. Here’s Mike Fast’s pitch fx scouting report from ’09, and you can look at the data from the WBC here. In his first start in camp this year (on 3/5), his velocity was down enough that the Pitch FX algorithm thought he was throwing mostly splitters. His first fastball registered only 86 mph, and he averaged 89 mph for the game. Against the Dodgers on 3/10, he touched 91, and was able to differentiate his splitter and FB enough for Pitch FX to recognize them, but he still averaged 89 mph. In both starts, his velocity actually crept up over the course of the outing, which is encouraging. It’s not that Iwakuma’s broken, or that he’s not the same pitcher he was – he’s just not that pitcher right now. Let’s not forget how difficult this transition is for Japanese starters: in Japan, Iwakuma started once a week, and never tallied more than 28 starts. Last season, he made only 17, and now he’s not only trying to get his arm strength back, he’s trying to learn to pitch more often too. Given a “normal” spring training schedule, he’d have half a chance, though I’m doubtful that another couple of weeks would be enough. This year’s anything but normal though, and the compressed schedule left him essentially no chance to be ready to throw effectively every five days. Eric Wedge’s plan to ease him in to MLB by serving as a long-reliever seems reasonable given this context, and taking things slowly in April might help the M’s to maximize his effectiveness in the second half. OK, sure, so Iwakuma may need more time, but Blake Beavan? The guy who struck out less than 4 batters per 9 innings last year? Quick – name the Mariner with the best FIP projection (by ZiPS and CAIRO) from this list: Erasmo Ramirez, Charlie Furbush, Hector Noesi, Blake Beavan. Beavan comes out #1, clearly ahead of Erasmo and Furbush, and neck and neck with Noesi (Beavan’s got a better CAIRO projection, and while Noesi’s is a tiny bit better, it’s based on Noesi making half of his appearances in relief). Ah, but a FIP projection’s cheating, as walks are one of the three inputs to the formula. No surprise that a guy with a tiny walk rate has a decent FIP. This is true, but the same’s true using RA. Since 2000, 62 starters with at least 90 IP have had seasons with a walk rate under 2 and a K rate under 5.5. Pitchers posted an ERA+ over 100 in 39 of them. While the best season was turned in by ground-ball machine Derek Lowe, fly-baller Mark Buehrle is on the list several times. To be very clear: this isn’t a study of Blake Beavan’s chances in 2012, it’s a proof of concept. If you keep your walks very low, it’s possible to have success even without missing bats. I’m not comparing Beavan to Buehrle (or Greg Maddux), I’m just saying that “boring” can be effective, especially for a team in Safeco. Sure, M’s fans experience with extreme pitch-to-contact players has been colored by the horrors of late-career Carlos Silva and the Anthony Vasquez Experiment, but this is a type that can add value. Paul Byrd, Nick Blackburn (before he started walking people), Tommy Hunter, Jeff Karstens, Carl Pavano, Jeff Francis, Josh Tomlin, etc. Would you give a pitcher like this a free agent contract? No. Will some of these guys homer problems lead them back to replacement-level status? Kevin Slowey is nodding ruefully. But the M’s have the luxury of having replacements in AAA and Beavan’s both pre-arb and has options left. Erasmo Ramirez has similar low-walk credentials coupled with better stuff. Let’s be clear: Ramirez is much more talented, and could be better than Beavan as early as 2012. But while Ramirez control’s quite good, Beavan’s is a touch better. Ramirez gave up 42 free passes last year between AA and AAA in 153 innings, or 2.47 per 9 innings (his low walk rate was partially undone by a penchant for plunking hitters). 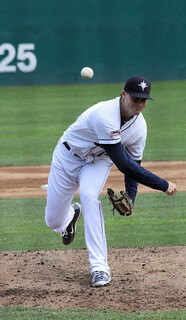 Beavan gave up only 39 in 190 innings – 1.84 per 9 innings against better competition. Their HR rates are closer than you’d think, given that Ramirez spent most of his time in the low-HR Southern League whereas Beavan split time between the PCL and the majors. At some point, Ramirez will stop leaving fastballs out over the plate, and his change-up will be consistent enough that hitters can’t simply look to hit his 93-94mph sinker. When that happens, none of this will matter, and he’ll bring his plus command, plus velocity and plus ground-ball rate to the majors. Until then, you can make the case that Beavan’s a better fit for the big league rotation right now. Ramirez’s MLB projections aren’t great, and he slipped up in the PCL last year despite his great velo and sink. Let’s say Ramirez lays waste to the PCL, or that James Paxton’s ready for a promotion on June 1. Could the M’s actually move Beavan? Who wants a pitcher who can’t miss any bats? The A’s got decent production from a similar pitcher in Guillermo Moscoso last year then flipped him for a solid bat in Seth Smith. The Angels’ Tyler Chatwood missed very few bats (74 Ks) AND he walked/plunked lots (73), but he was still traded for a solid MLB catcher. Chatwood throws harder, but he had a K:BB of 1:1 and actually posted a lower swinging strike rate than Beavan, and he was STILL enough for the Angels to upgrade from Jeff Mathis to Chris Iannetta. I’m not Beavan’s biggest fan, but I think it’s hard to knock this move. If you’re positive Erasmo’s better, are you willing to burn a year of club control to make him the 5th starter now? What does that do to Beavan’s value, and would it be the best situation for Ramirez to develop more consistency with his offspeed stuff? The M’s have the perfect park and a good-enough defense to help Beavan be successful. There are no guarantees, and he could start giving up HRs like the steroid-era Kingdome, but he could also get a bit lucky and post a FIP under 4. All told, I think it’s hard to argue with. I agree Beavan is more effective than he is given credit for by most fans. I’d still prefer Erasmo though. Everything you say makes perfect sense. I wonder if the organization’s thinking got much past “Iwakuma’s arm probably needs to be babied”, though. Amen, brother. Ramirez obviously has the better stuff but the amount of pitches he leaves over the plate is concerning. No harm in giving him a couple months to work on things in AAA, where he had an ERA over 5 last year. Iwakuma’s arm troubles were concerning from the very beginning and using him out of the bullpen at first seems more prudent than just assuming his arm will be able to take the added work load right out of ST. If Beavan develops into Vargas – great. If not, Paxton/Hultzen/Ramirez are going to be knocking on the door by July anyways and Beavan can be AAAA injury insurance or a throw-in when Vargas or League is traded. He held his own last year and deserves the chance to do it again this year. I agree. I’m not ready to close the book on Beavan after 1+ year. He’s 23 years old. I’d rather watch Erasmo, Furbish, Beavan, than Vargas. Here’s what I want to know about Blake Beavan, and IMO these are questions that should be asked, and answered, once and for all. When Beavan was acquired, all accounts said that he had been throwing his fastball 97 MPH when the Rangers drafted him out of high school. Is this true, or is it a myth? The accounts also said that the Rangers thought he had terrible mechanics, and that they revamped his whole delivery. Supposedly this gave him stability and command, at the expense of velocity. Is this also true, or is it also a myth? If the Rangers made him a first-round draft choice, what did they see in him that justified that pick? What were their projections for him, before and after they revamped his mechanics? What are the Mariners’ projections for him? The dude is 23 years old and he is 6’7″ tall. Do the Mariners think there is any chance that he can add velocity? Does Blake Beavan think he can add velocity? Is there a plan afoot to see if Beavan can add velocity? If the answer to any of the three questions in the immediate preceding paragraph is yes, then I want to see him pitching, and pitching plenty, for the Mariners. If the answer to all three questions is no, what you see is what you get, and this is all he’s ever going to be, then fine. We have what we have. But I’m still not satisfied. If he threw 97 once, and that is indeed true, why on earth wouldn’t he try to get at least 2-3 MPH of that back? Why wouldn’t the Mariners want to see if he could add velocity? What do Beavan, and Willis, and Wedge, and Zduriencik think the tradeoffs might be? These are the questions I would like to see answered about Blake Beavan, before he becomes the next Fister. I do not claim to have any, much less all, of those answers. Great post Marc. Everything makes perfect sense. I thought Ramirez was hanging too many pitches as well, but it’s the super-two issue that concerned me more. Beavan does seem to be the right choice (I’d take him over Furbush as well -for now) despite the lack of K’s. I’ve wondered if he’ll be shopped fairly soon anyway with all the AAA talent coming up, so getting him some starts early probably benefits the team several ways. One thing that surprised me, was hit-batters. Wasn’t aware Ramirez was plunking so many. Kind of a hidden number that isn’t usually given a lot of thought to, though it still produces base-runners. Wouldn’t it be funny if there was a bounty involved?! Rather than intentional walks, he simply plunked the hitters?! I’m kidding of course, though I’m sure it’s happened before. This is a very good post, less because of the particular topic of Beavan, more because having two well-reasoned, but different opinions from blog authors is a big plus for the readers. This is a real asset to USS Mariner. Agree with IdahoFan – nicely put. My initial reaction was similar to Dave’s but I didn’t realize the injury history & think easing Iwakuma into things this year might be the best move. I also like the potential of building Beavan’s value & flipping when we have that luxury. Nice work Marc. Yes, this was a much more thorough comparison that Dave’s, which looked at a measly 3 statistics (Ks, BBs, and HRs) and tried to convince us that Beavan and Iwakuma had “performed identically”. Dave correctly told us not to focus on hits and runs allowed, but he also ignored vital stuff such as pitch speed, placement, type of pitch, etc.